Voters will decide November 8 on Measure M, a proposed half-cent tax increase that would fund dozens of rail, freeway, and biking projects throughout the county. Among the juicy projects that could be built with the money—Metro bean-counters anticipate Measure M generating about $860 million annually—are rail lines through the Sepulveda Pass, to Santa Ana, and via West Hollywood. In anticipation, and hope, of Measure M passing, Metro recently hired Ernst & Young to investigate potential public-private partnerships that would enable these projects to be built decades sooner than initially planned. WeHo has long been a proponent of rail transit, voting overwhelmingly for the last transit tax—2008’s Measure R. Late last year, the city even set aside $200,000 to lobby Metro for a rail project. 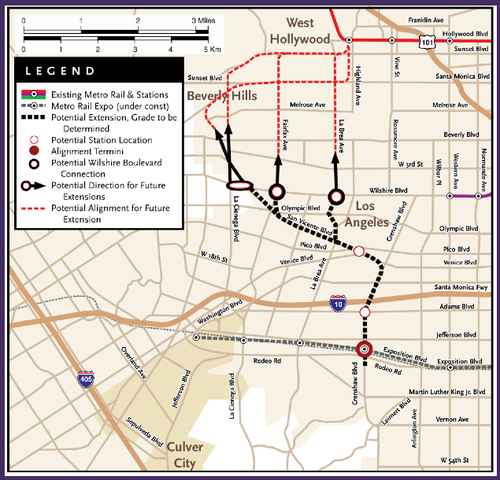 While Metro once considered building a WeHo subway spur in tandem with construction of the Purple Line extension on Wilshire Boulevard, the proposal was scrapped for cost reasons. The plan now is to serve WeHo through a northern extension of the Crenshaw Line, which is currently being built in Westchester, Inglewood, and the Crenshaw District. Years ago, Metro studied just such a WeHo extension and looked at bringing the line up either La Brea, Fairfax, La Cienega, or San Vicente. Metro has yet to commit to a specific route, but the agency has made it clear they want the line to terminate at the Hollywood/Highland Red Line station. So what are the pros and cons of each WeHo option? Let’s discuss. Pro: Dense and getting denser, La Brea is seeing construction of numerous shops and mixed-use developments. 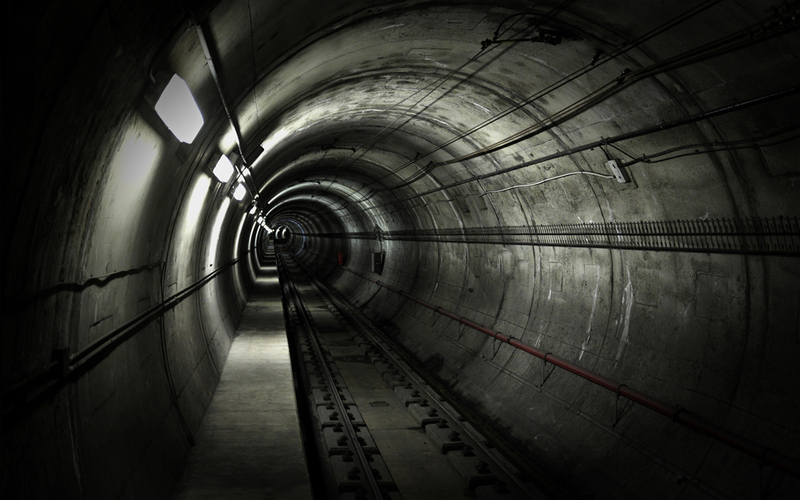 A subway (or, more accurately, an underground light rail) would help accelerate even more development. This line would also be the most direct route to Hollywood/Highland. Con: Sure there are restaurants and grocery stores, but in terms of nightlife, hospitals, and major work centers, La Brea strikes out. Pro: Fairfax is an iconic, historic street in Los Angeles and, in the ’80s, was going to be serviced by a subway (an explosion at a Ross store on Fairfax convinced officials to move the subway’s path to Vermont Avenue because of supposed methane gas concerns). A train on Fairfax would service the Grove, CBS Studios, and the shops of Melrose Avenue. Plus, there are plenty of nearby residents who would get good use out of rapid transit service. Con: Fairfax is already very developed and quite narrow, meaning construction would be rough. The stations would likely necessitate the bulldozing of some much-loved buildings. Pro: A La Cienega train would allow service to the Beverly Center, as well as a short walk to nearby Cedars-Sinai Medical Center. Con: Aside from the mall and hospital, La Cienega doesn’t hit many major attractions. Neither Melrose and La Cienega nor Santa Monica and La Cienega offer much in the way of jobs, entertainment, or shopping. Pro: This route would hit numerous destinations, including the Beverly Center, Cedars-Sinai, the Pacific Design Center, and the heart of West Hollywood, with its bars and clubs. A train here would allow car-less access to everything from the LGBT Pride festival to the WeHo Halloween carnival. San Vicente also served as a historic route on the Pacific Electric Railway. Con: This route would require a major dog-leg to connect to Hollywood and Highland and would increase travel times by a few minutes.